Columbadi/Friday Day of Madria Grace. O, Madria Grace, Jana of Compassion, Love and Mercy, be with us. May the Pure Stream of Your Virtues flow within me, in this world and in all the worlds to come. Blessed are You. This brief Bits and Pieces covers Fairies, Auroram and our Trinity Days. One thing that I love about our religion is that we believe in fairies and the nature spirits. This woman spent decades writing this book. The first intro and forward are a bit tedious, but contains some important information. On the other hand, the author’s ‘voice’ is engaging and I have been enthralled with what I’ve read so far. Hundreds of people have seen fairies over many centuries. How can they all be mistaken? We are coming to understand that not only is life most likely on other planets, but possibly in other dimensions. Our eyes are capable of seeing only so much. There might be a lot of things around us, that we are not able to see. 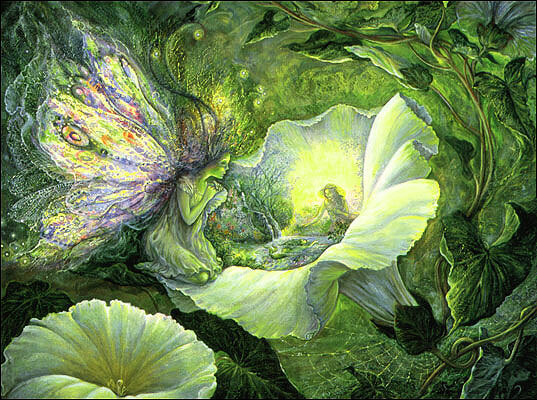 If we can believe in angelic beings who live on an higher vibrational realm, why do so many discount the possibility of fairies who also live at an higher vibration? One thing the author of this book explained was: All these beings are the manipulators of the forces of Nature. They are active in the Mineral, Vegetable , Animal and Human Kingdoms and play an essential part in the Divine Plan. Their bodies are fluidic and self-luminous and they can assume different forms, but mostly imitate the human They may be seen as pulsating clouds of colour or as tiny etheric lights. Some have wands, which are a symbol of authority in the Fairy World. All these nature spirits are part of the Angelic Hierarchy and evolve eventually into Angels. As you can see, we find some Deanic teachings in the above paragraph. There are other compatible spiritual concepts mentioned in this lovely book that would be of interest to Deanics, as well. With the Feast of the Fairy Queen, Aine, coming up on 8 Rosa/June 20, this is quite a suitable book to read in preparation for the upcoming festival. The Fairy Queen Aine was the Divine Mother Goddess Aine. Beautiful rosary hand-crafted by Miss Leah of the Deanic Ladies Community. I am very pleased with Sorella Minna’s idea of referring to rosaries as Auroram. The Janites will be adopting this practice, as well. I am not fond of the term ‘Rosary’ for Déanic prayer beads. The Catholic church is too rife with controversy and abuses for me to be comfortable sharing any terms. So instead, I offer a term for Déanics in reference to prayer beads:‘The Auroram’, which translates as, ‘The Dawn (which I act upon)’. With a base in the word Aurora, symbolizing the Daughter, I feel it quite fitting. To be done on a string of 108 beads (picture coming soon). Nine sets of a trio of small beads with a larger bead in between each trio, repeated three times total for 108 beads. A small charm can be put between each set of 36 beads (nine trios with a large bead between each trio) as well. Hail, Mysteria, Fountainhead of Grace, glory be to Thee. Blessed art Thou, O, Empress of Heaven and blessed is the beloved Mother and Daughter. Holy Dea, Great Mother God, bless us, Thy children, now and unto the ages of ages. Amen. While each day is Sacred, the three days of Foradi, Sunnadi and Lunadi are considered, within Janite Tradition, to be the Trinity Days. Foradi/Sat. is not only the day of Madria Rhea, but it is also the day of the Great Mother, Mysteria. Sunnadi/Sunday is the day of Madria Theia and of the Celestial Mother, Mari. Lunadi is the day of Madria Candra and of the Holy Daughter, Kora. Most of our devotees serve the Rite of Sacrifice on the Full Moon, only. Madrians served it on other Moons, too. Some devotees are also drawn to serving the Rite of Sacrifice each week. In this case, the practice of our priestesses might be adopted. We serve our liturgy on any one of the Trinity Days. And so we might serve the liturgy either on Foradi/Sat. (in honor of the Great Mother); Sunnadi/Sunday, in honor of the Celestial Mother or Lunadi/Monday in honor of the Holy Daughter. One practice might be to serve the Rite of Sacrifice or liturgy according to the nearest moon. For instance, for the weekend after the Full Moon, the RoS or the liturgy could be served on Sunnadi, in honor of the Celestial Mother. On the weekends after the waxing and waning Crescent Moons, Lunadi would be chosen. On the weekend after the Dark Moon, Foradi would be chosen, each with their appropriate Preface. But, this is entirely according to personal desire. I do think I’m going to start making this my personal praxis. This way, the liturgy becomes very Trinitarian. However, I wish to make clear that for devotees and our Sisterhood, the only mandate is to serve the RoS on the Full Moon. All else is optional, according to personal desire.